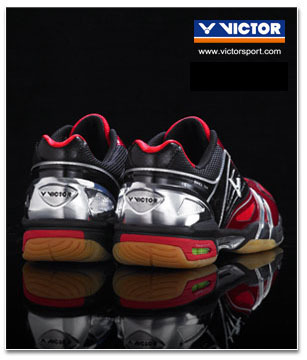 Following the SH9000ACE equipped with the TRINETIC system in 2012, Victor has now brought out a totally upgraded new shoe in the SUPPORT series. 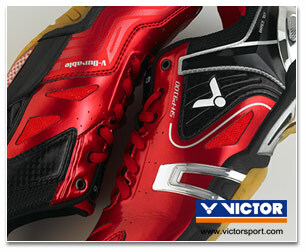 The SH-P9100 not only features TRINETIC 2.0, the sole has the newly developed high elasticity material ENERGY MAX3.0. 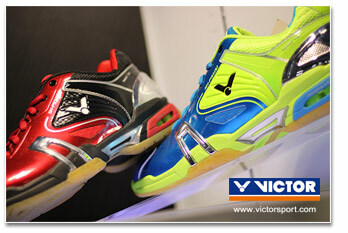 It is certain that VICTOR fans will be waiting to try out these excellent new shoes for themselves. Now let’s find out about VICTOR’s new SH-P9100 that will be the focus of promotional efforts in spring and summer. First the upper; the SH-P9100 leaves behind the conventional practice of alternating layers of PU leather and uses the No-Sew technique to give the shoe a neater look overall. Also, paying attention to the need to give the upper the ability to bend easily, between the 1-2 and 3-4 lace holes a groove has been added. The TRINETIC system used in the SH9000ACE has been upgraded for the SH-P9100 and has been renamed TRINETIC 2.0. TRINETIC 2.0 retains the high elasticity and stability of the earlier version and also has a 35% improvement in cushioning effect. 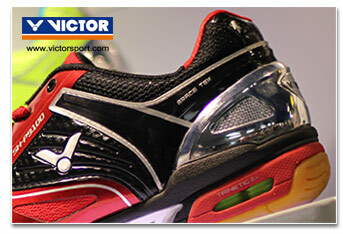 “TRINETIC 2.0” can be clearly seen on the heel and is slightly different in style to TRINETIC. The main function of the newly developed high elasticity material ENERGY MAX3.0 is to increase the sole’s bounce ability and impact cushioning effect when the wearer takes a step; it has 60% more bounce than most EVA material in the market. 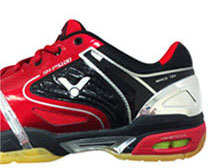 On the SH-P9100, ENERGY MAX3.0 is used in the front foot, the heel and the liner. “ENERGY MAX3.0” can be clearly seen in orange on the heel and “ENERGY MAX3.0” is also printed on the liner. It is also worth mentioning that the SH-P9100’s middle sole also features the new Light Resilient EVA, giving lighter weight and improved durability and bounce; it reduces the burden on the foot muscles, lengthens use life of the shoe and also increases step bounce. ENERGY MAX3.0 and Light Resilient EVA used in combination give a foot feel like you have never experienced before. Another distinctive feature of the SH-P9100 is the support system exterior design of the heel which uses a large silver extruded plate. This has a stabilizing function as well as complementing the silver LS-S lateral stability system design the forefoot, giving a fashionable technological feel. The BRACE TEK close fit design extends from the outside of the upper to the heel, connecting to the silver heel stabilizing design and greatly increasing the stabilizing function of that part. The shoe’s inner toe uses VICTOR’s abrasion resistant V-Durable synthetic leather PU leather and transparent 3D printing abrasion resistance technology is used from the toe to the forefoot, places easily damaged by abrasion, increasing the use life of the shoe. The workplace is like a match, mental strength decides who wins!